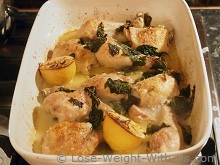 This basil and lemon baked chicken thigh recipe is excellent for a Sunday roast and is also quick enough for dinner after a busy day at work. 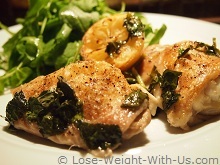 Chicken thighs are the most flavorful part of the chicken and a real treat for our taste buds. 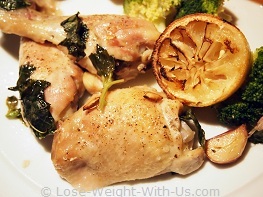 Oven baked lemon chicken goes well with romaine lettuce or steamed broccoli, garnishing with 1 cup of shredded lettuce will add 8 calories and 0.3g of net carbs; 1 cup of steamed broccoli adds 55 calories and 6g of net carbs accordingly. This recipe contains 350 calories and 3g of net carbs per serving. 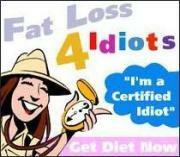 Recipe Nutritional Profile: Diabetes Appropriate, Healthy Weight, Heart Healthy, High Protein, Low Calories, Low Carbs, Low GI, Low Saturated Fat, Low Sodium, Gluten Free, Dairy Free, Good Source of Vitamin B-6, Manganese, Niacin, Pantothenic Acid, Phosphorus, Riboflavin, Selenium and Zinc. 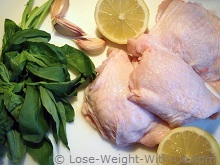 Wash the chicken, remove the excess fat from the meat, but leave the skin on. Place the chicken in a baking dish. 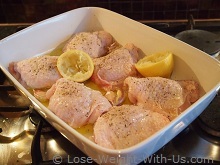 Dribble the oil over the chicken, cut the lemon in half and squeeze it over the chicken and throw the lemon halves in the baking dish after squeezing. Add squashed garlic cloves, salt and pepper. Put the baking dish into the oven and cook for 30 min. After 30 min of cooking, add the basil and cook for 10 min. Remove the baking dish from the oven and put on the hob over a high heat, add the white wine and let it bubble for few minutes. Serve hot with steamed broccoli or salad leaves, don't eat the skin no matter how tempting.